TBI's Marco Sanchez kicks off The Sales Series addressing common questions partners ask around security. In this series, partners learn about what we're hearing in the field around specific solutions and best practices to implement with their customers. 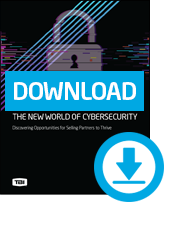 Hackers are becoming more sophisticated, which takes equally more sophisticated people to stop them, and there simply isn’t enough out there, meaning larger enterprises have the talent more and more, and the mid-level companies are left behind. If a company can afford them, they are incredibly expensive, and the industry is adapting so fast, that if one doesn’t stay on top of every security threat and vulnerability out there, they could be at risk. Overall, the number of risks are increasing as more attacks happen due to vulnerabilities created from solutions like Mobility, IoT, and number of applications moved to the cloud. Help your customer develop a security policy, you can setup a fee for this service or leverage a vendor to do so. Leverage TBI's end-user content and campaign portal, Partner Marketing Center, to market security.